Style "My style of ceremony is upbeat & fun mixed with reverence for the love of family & friends who are there to bear witness to the official joining of the couple." "I have a sense of humor & make the experience fun for both the couple as well as their guests. While I talk mostly to the couple, I try to always include the guests to make them feel part of the experience." "I've been featured on "Four Weddings" & the "Rachael Ray Show," as well as in the New York Times & New York Magazines annual bridal issue. I create all ceremonies from scratch to represent my couples' preferences & personalities." We contacted 21 DJs and pianists and recommend these 4. Kyle Landry is unfortunately not available that weekend to perform. We contacted 16 florists and recommend these 3. They all quoted the same floral items in their proposal; If you want to decrease costs further, you can remove items from the proposal. We contacted 7 florists and recommend these 3. The prices below are subject to change if you add or remove to the proposal. You should review each florist’s visual proposals, linked in Pricing. Experience Has worked at The LINE and Ace. -View the proposal to see which designs can be removed to fit your budget. N/A -Reusing florals from Mandap in floral wall design at reception. We contacted 17 photographers and recommend these 3. To prioritize capturing intimate moments, we’d recommend coverage from 8am-2pm, 6 hrs. We also got quotes to cover the first half of the reception dinner 6-7:30pm (7.5 hrs total), which you can see here. Style "My style is photojournalistic & patient; I like to let my clients enjoy & unfold within their day naturally." "I’m about the genuine, quirky, sarcastic, teasing, loving, quiet, loud, fun & unique love that you have." "I have a warm & very candid style. I want to document your love in a way that reminds you time & time again why you fell in love." 15 options matched your preferences, and we recommend these 3. Each quote below is based off the following images and designs, but please note that the decorators will work with you on revisions and customization after you book with them. Working Style Friendly, responds quickly, flexible, and creative with cost effective designs. Responds quickly, less flexible with budget, but has strong design expertise. 22 photographers matched your criteria. We recommend these 3. Style "I describe my style as joyful, romantic, dreamy & fun with a touch of whimsy." "I love documenting your wedding day in a photo journalistic, unposed, beautiful way." "My style is light, airy & romantic & a mix between posed & documentary. " For Lulu and Karishma Beauty Salon, their quotes are also in Airtable for easy comparison. Drea is not available. Lulu would have Rosie for hair and Denise for makeup. 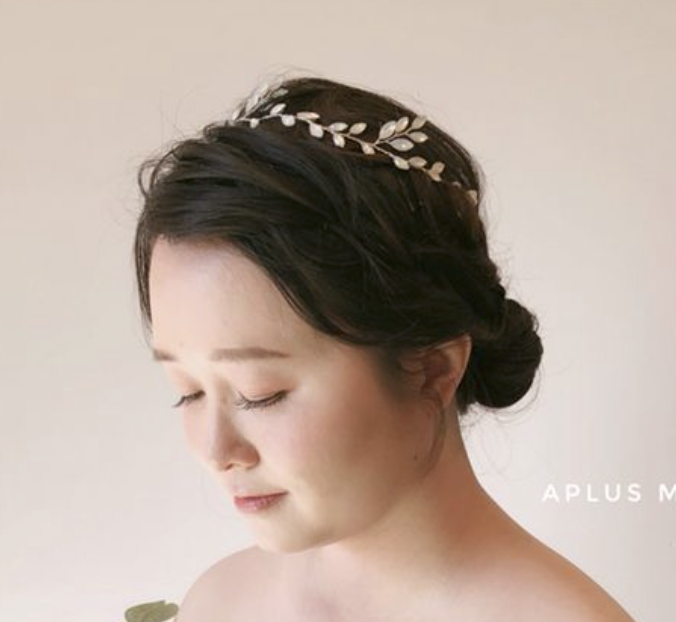 Bride cost would be $1,285 (including $60 travel fee), $180 for trial, and $680 for additional hair & makeup for 4. She does not offer saree draping. Karishma Beauty Salon would be bride cost $1,175 (no travel fee), $150 for trial, $600 for hair & makeup for 4, saree draping $30/person. Location 800 N. Alameda St.
10 min drive from Office Party 2701 N. Sepulveda Blvd. Style "Our style is documentary, candid, photojournalistic with a mix of traditional posed when appropriate." "I pride myself on always improving and staying inspired to create fresh, emotional images, and of course, I want to have fun." We received your florist response! We contacted 17 florists and recommend these 3. Style "Our style is documentary, candid, photojournalistic with a mix of traditional posed when appropriate." “I document the tears, laughter, excitement, and love between the couple so that when they look back, they can relive the day." "I create unique, contemporary lifestyle images with a fashion twist." option for all-inclusive with DJ, florals, etc. All options have 2 violins, 1 viola, and 1 cello and can play both classical and contemporary repertoires. Your 2nd round venue matches are ready! Restaurant/bar/venue in either SF, Oakland, or Berkeley. A venue that has character, is aesthetically appealing by itself and has indoor and outdoor areas. Minimal effort to tailor the decor to our event but want to avoid it looking 'thrifty.' We are looking for more classic/modern than rustic in style. Open to having the end time be earlier than midnight, so long as there are bars nearby for the party to move to after. To note: the biggest reasons we rejected restaurant venues was guest count (many cannot fit 100 + dance area) and type of food/serving style (plated fine dining). If you've changed your mind on either of these factors, let us know! Larger list of 53 venues contacted. Your florist matches are ready! We contacted 19 florists and recommend these 3. We've already negotiated with each florist, resulting in $500-$700 discounts for each. These quotes include what you specified in your floral quiz, and with tax & delivery, are above your budget of $5,000. At this point, we recommend selecting a florist you like, and we can adjust the quote while doing a second round of negotiations to decrease cost. Style "I seamlessly shoot both digital and film. My style is soft organic and candid, while paying a close attention to detail. I shoot every wedding as if it were my own." "I developed a love for classic film and photography at an early age, and focus more on fine art portraiture." Style "From the picturesque locale, to the laughter, tears and cheer of your guests, each exquisite detail of your special day will be captured." "My specialty is medium format film and timeless romantic photographs that evoke emotions and tell a story. I focus on nice light and beautiful outdoor shots." "My goal is to unveil the love you have for each other while blending in my own artistic artistry through photographs." "I developed a love for classic film and photography at an early age, and focus more on fine art portraiture." Style "Lean toward "photojournalistic" and live for capturing honest moments in a storytelling way" "Capture what is happening organically, those little moments you are missing.Jump in to direct you when a good photo op presents itself. Work alone as much as possible, and only use flash at very low settings when absolutely necessary." "Blend of photojournalism and fine art portraiture; where we guide you into the most flattering light and poses, while retaining a natural and candid feel"
These venues are available for 9/21/19 as of now, fit 150 people, and are realistic options for your budget of $40K (industry benchmarks say <20% of budget on venue rental with BYO caterer, 60% on all inclusive venues with catering). We researched 46 venues and recommend 4 options for your rehearsal dinner venue. These venues are available for 9/14/18 as of now, fit 125 people, and are realistic options for your budget of $40K (industry benchmarks say 20% of budget on venue rental with BYO caterer, 60% on all inclusive venues with catering). Other vendors welcome Due to local noise laws, no DJs allowed. 3 instrumentalists allowed (no drums, horns, singers) in garden until 9pm. Below are our top 3 recommendations for your blues band. All quotes are for 7-10pm on 9/22/18 at Spring Ranch, Mendocino. Scroll down and respond with which vendor you'd like to book. Guitar player has backed up Bob Dylan, Bruce Springsteen, Rick Danko and Garth Hudson of The Band Band has performed at The Monterey Bay Blues Festival, The Delta Blues Festival, The SF North Beach Festival and many others. We researched 12 venues and recommend 4 options for your rehearsal dinner venue. The prices below are for the date of September 28, from 5-9pm. Make your venue decision by Saturday, July 28. Other Notes Decorations in the space change in accordance with season. Important: To fit dinner logistics into 1 hour, you will need to hire additional servers who can collect menus and serve food. We also recommend that you collect guest choices 1+ hour prior to dinner service, and limit each guest to select from one truck. Below are our top 3 recommendations for your hair & makeup stylist. We contacted 23 and vetted them for availability, style, experience, and budget. We've updated the prices to reflect the cost for 100 servings per truck, instead of 150. Select two trucks you'd like to book. Reviews Yelp, 5 stars & 2 reviews Affiliated with Glamour by Kary Li - Yelp, 5 stars & 101 reviews Yelp, 5 stars & 83 reviews. Wedding Wire, 5 stars & 6 reviews. Yelp, 5 stars & 2 reviews. Below are our top 3 recommendations for both your ceremony musician and your reception DJ. We looked at 24 options to surface these. Scroll down and respond with which vendor you'd like to book. Below are 4 DJs from Beat Train Productions, who are all available on September 29th for your wedding. Please provide your input by June 29, Friday. Get Down, Upstate was not available for September 29th. 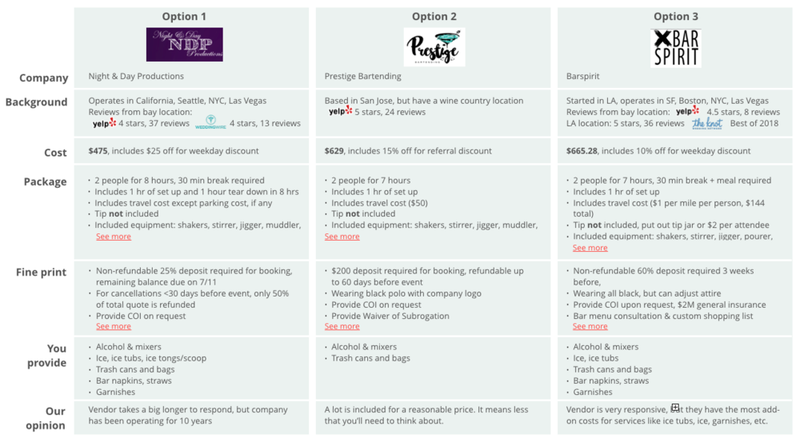 We researched 15 bartender options, and recommend these 3 based on your preferences and needs. Below are your venue results. We contacted 45 venues and looked for outdoorsy, activity-filled, onsite-lodging venues that were within 1.5 hour driving distance of a large airport. We used your location preferences. Note - Even if lodging is included in the reservation cost, we separated it out from the venue reservation, so you have an idea of what you and AJ will pay at the end of day. Below the table are links to their websites and links to wedding photographs taken at these venues. If you would like to schedule a visit with any of these venues, book, or view more information, then respond below. Below are your catering results. We contacted 15 caterers and restaurants and looked for vendors who could work with your preferences for Swedish and South African cuisine. If you would like to book a tasting with any of these caterers, book them, or view more information, then respond below. Deposit - $500 Deposit is required upon signing contract . Other Notes -The ceremony (outdoors) is dog friendly. The reception (stone barn) is not. must reserve for 3 nights min. - If guests stay overnight, they must reserve for 3 nights min.